Background: Cerebral hemorrhage (CH) could affect the cerebral function on specific cognitive abilities and lead to the cognitive decline or cognitive dysfunction. Electroencephalogram (EEG) is a relatively cheap and easy usable tool, which could reflect the cerebral function of the patients. Materials and Methods: A total of 170 patients (patients with and without cognitive impairment) with CH and 120 normal healthy controls were recruited from September 2008 to June 2012 at the Department of Neurology. EEG studies were carried out to analyze the cerebral function in all the subjects. Correlation, clustering and concordance analysis were performed to analyze the relationship between EEG power and Montreal cognitive assessment (MoCA) scores. The effects of EEG analysis were assessed to diagnosis the cognitive impairment. Results: The results were showed that patients with cognitive impairment had a significantly decreased EEG beta power (0.771 ± 0.149 μV 2 ) compared with the normal cognitive function (1.654 ± 0.186 μV 2 , P < 0.01) or normal healthy controls (1.703 ± 0.216 μV 2 , P < 0.01). Significantly positive correlation (r = 0.90174, P < 0.001) was discovered between relative beta power and hemorrhage type, while significantly negative correlations between the relative beta power and hemorrhage size and amount were also observed (r =−0.81235 and r =−0.90136, respectively, all P < 0.001). There was a better concordance between K-means clustering algorithm calculating of the relative beta power and MoCA scores (κ =0.913, P < 0.001). Conclusion: The cognitive impairment post hemorrhage was positively correlated to hemorrhage type and negatively correlated with hemorrhage size and amount. The analysis method of EEG beta power abnormality holds a promise to assess the cognitive impairment post CH. Electroencephalogram (EEG) is a relatively cheap and easy to use tool. EEG has been used to assess the cognitive function of patients with brain injury or degenerative diseases. In Alzheimer's disease (AD) patients, abnormal EEG recordings could reflect cognitive decline status. Signs of diffuse EEG slowing are useful in differentiating the healthy humans from AD patients. Thus, EEG recordings may provide valuable diagnostic assistance in evaluating patients with cognitive impairment. EEG beta power was employed to investigate the cognitive impairment after CH. K-means clustering algorithm was used to divide CH patients into cognitive impairment group (CHCI) and congniive normal controls (CHNC). Meanwhile, the normal subjects were also employed as the control group cognitive normal (CN). In present study, the beta power recordings were detected and analyzed and the potential value for cognitive impairment of CH patients was investigated. In the present study, 170 CH patients (51 patients with thalamic CH, (84 patients with basal ganglia CH, and 35 patients with both) were recruited from September 2008 to June 2012 at the Department of Neurology of Xinqiao Hospital. Also 120 normal healthy controls (CN) were selected from Physical Examination Center. Informed consent was obtained from either the patients or care givers. Montreal cognitive assessment (MoCA) scale (Beijing version) was used to assess the cognitive impairment at the time of EEG and at 12 weeks post CH. Of the 170 patients, 105 (61.8%) patients with a MoCA score less than 26 were grouped as cognitive impairment (CHCI) group and 65 (38.2%) patients with MoCA score more than 26 were grouped as cognitive normal (CHNC). All the subjects with MoCA score more than 26 were grouped into CN group. Some standardized diagnosis scales, such as Hamilton depression rating scale (to exclude the depressive disorder), Hachinski ischemic scale (to exclude AD), instrumental activities of daily living, basic activities of daily living and clinical dementia rating scale were selected to exclude other diseases. EEG recordings and analysis EEG activity was recorded continuously from 16 channels by using the standard EEG electrode placement (Jasper 10-20 electrode placement) and positioned according to the 10-20 international systems (Fp1, Fp2, F7, F3, F4, F8, T3, C3, C4, T4, T5, P3, P4, T6, O1 and O2). EEG data were analyzed and fragmented off-line in consecutive epochs of 2 s, with a frequency resolution of 0.5 Hz. The EEG epochs with ocular, muscular and other types of artifacts were preliminary identified by a computerized automatic procedure. EEG epochs with sporadic blinking artifacts were corrected by an autoregressive method validated in Moretti's et al. study. Eight beta bandwidth signals of EEG channels (including Fp1, C3, C4, T4, T5, P3, P4 and O2) were selected for CH patients in this study. Using these 8 channels selected, an eight-dimensional characteristic vector and a characteristic vector array were obtained. In order to classify the characteristic vector array, the K-means clustering algorithm was employed. The K-means clustering algorithm was used to calculate the centroid (mean EEG power) for each category (CHCI group and CHNC group). The value of the centroid was then iteratively adjusted until the differences between data points and the centroid for each group was minimized. The steps in the algorithm were as follows as in the previous report:  (1) Choose K initial cluster centers (two centers, CHCI and CHNC, K = 2); (2) Calculate the Euclidean distances between the feature vectors; (3) Find the centroids of the newly created K clusters; (4) Using the centroids of step 3 as cluster centers, repeat step 2 and step 3 until the centroids no longer changed. At this point, the algorithm is assigned to attain "convergence", i.e., they no longer change with subsequent iterations. SPSS (19.0 version) statistical software and t-test were used for data analysis in this study. The K-means clustering was performed using MATALAB R20120a software. Both of K-means program algorithm and MATLAB function were applied to determine clusters. The concordance analysis was analyzed by Kappa test. No significant differences for gender, educational level, hypertension, hyperglycemia, disease course were found among all the three groups. There was a significant difference for the location of hemorrhage in CHCI and CHNC groups. The occurrence of the basal ganglia hemorrhage in the CHCI group was significantly higher compared with the CHNC group [[Table 1], P = 0.008]. The occurrence of the thalamus hemorrhage in the CHNC group was significantly higher compared with the CHCI group [[Table 1], P = 0.006]. The occurrence of both hemorrhages in the CHCI group was significantly higher compared with the CHNC group [[Table 1], P = 0.001]. The EEG beta relative power in CHCI patients decreased significantly (0.771 ± 0.149 μV 2 ) compared with CHNC (1.654 ± 0.186 μV 2 ) (P < 0.01) or CN group (1.703 ± 0.216 μV 2 ) (both P < 0.01) [Figure 1] and [Table 2]. Relative beta power values for CHNC group were closely aligned with CN group suggesting no significant difference between CHNC and CN group (P > 0.05) [Figure 1]. [Table 3] shows the MoCA scores for both at the time of EEG and 12 weeks post disease in the three groups. For the initial EEG, the MoCA scores of CHCI and CHNC patients (15.71 ± 2.03 and 18.15 ± 1.85) were significantly lower compared with CN group (29.25 ± 1.97) (both P < 0.01). The MoCA scores of CHCI patients were also significantly lower compared with the CHNC patients (P < 0.05). 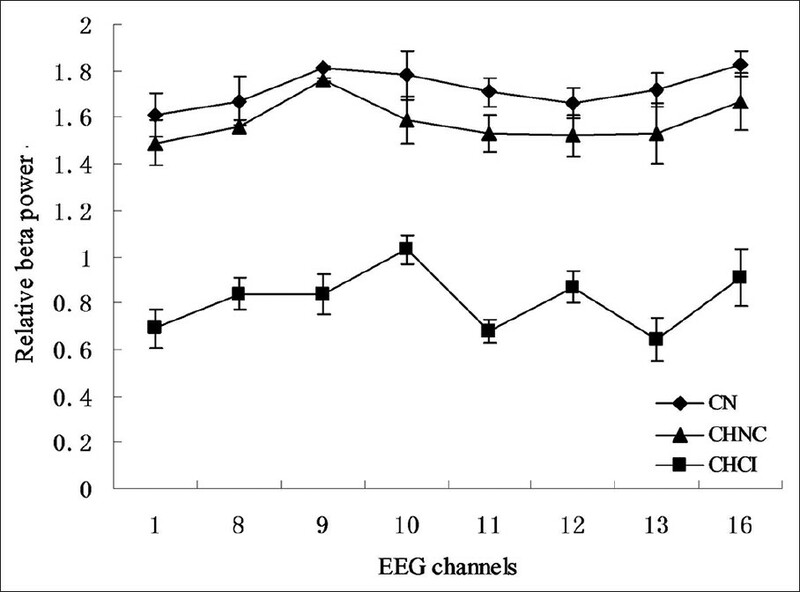 For the 12 weeks EEG, the MoCA scores of the CHNC group patients (28.67 ± 2.68) were significantly improved compared with the initial EEG (18.15 ± 1.85) (P = 0.021). Although the MoCA scores of CHCI group patients (16.81 ± 2.03) only indicated a little improvement compared with the initial EEG (15.71 ± 2.03) (P = 0.073). The correlation analysis results indicated that there was a significantly positive correlation between the relative beta power and hemorrhage type [Figure 2]a (r = 0.90174, P < 0.001). At the meantime, the relative beta value were negative correlated with the hemorrhage size (r =−0.81235, P < 0.001) and hemorrhage amount (r =−0.90136, P < 0.001), respectively [Figure 2]b and c.
The beta powers of 170 patients on the highest channels (1, 10 and 12) were reflected on the three-dimensional graph of beta power to observe the difference. The results were showed that the relative beta power from 63 cases out of the total cognitive normality post CH (65 cases for MoCA assessment) distributed in the interval I ([0.8, 1.5]); and 102 cases out of the total cognitive impairment post CH (105 cases for assessment) distributed in the interval II ([0, 1.0]) [Table 4] and [Figure 3]. Therefore, 2 cognitive normality and 3 cognitive impairment patients distributed in the interval III ([1.0, 1.2]), which were relatively far apart from both convergence center. Two specific convergence interval I and II were selected and the clustering results and MoCA scorings were compared [Table 4] and [Figure 3]. The results illustrated that 63 cognitive normality cases analyzed by EEG were consistent with the MoCA scoring and the sensitivity was 96.9%. 102 cognitive impairment cases analyzed by EEG were consistent with the MoCA scoring and the sensitivity was 97.1%. Kappa analysis results indicated that there was a better concordance between beta power analysis and MoCA scoring method for the cognitive impairment assessment (Κ =0.913, P < 0.001). Through the McNemar paired Chi-square test, we found that there were no significant differences between beta power analysis and MoCA scoring method for the cognitive impairment post CH [Table 4], P = 0.275]. Recently, exploring proper testing methods that could diagnosis the cognitive impairment post CH has become a hot field for the CH study. A series of standardized diagnostic method for cognitive impairment have been utilized. MMSE scale and MoCA scale have been performed to assess the cognitive impairment in some of the acquired diseases. ,, In the present study, the MoCA scoring was employed and combined with the EEG beta power to study the cognitive impairment post CH. CH patients were divided into two subgroups based on their EEG beta power using the K-means clustering technique, including interval I and interval II. The above classification was performed by using the 8 EEG channels exhibiting the largest differences in relative beta power. 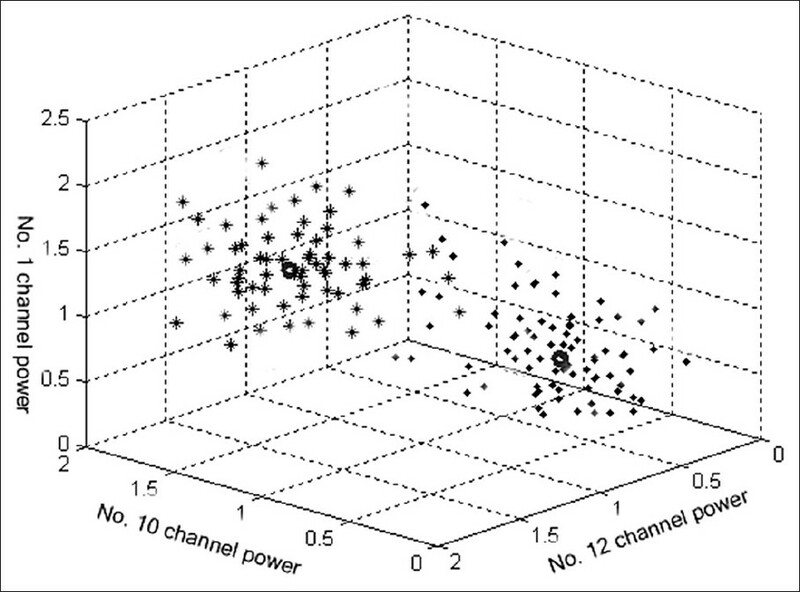 The beta power of patients was selected on the highest channels (1, 10 and 12) displaying the three-dimensional graph. The Kappa value more than 0.75 was thought to be a better concordance. The K-means clustering analysis shared a better concordance with MoCA scoring (κ = 0.913 for the cognitive impairment assessment, and the sensitivity could achieve 96.9% and 97.1%, respectively). The previous study showed that the beta power abnormality is effective in modifying CH patients who most likely to progress to cognitive impairment. Our results in present study is consistent with this conclusion. We also found that the analysis of beta power in interval III concerning three patients who were identified as cognitive impairment by MoCA scoring, but who didn't progress to the cognitive impairment in later follow-up diagnosis. While two CH patients in beta power interval III were assessed cognitive normality by MoCA scoring, who developed cognitive impairment in later follow-up diagnose. Hence we concluded that the EEG beta power may exclude the false diagnosis caused by MoCA assessment. In clinical, it's difficult to identify the cognitive impairment post CH in early time. While the EEG recordings could be selected within the 24 h post CH. This study demonstrated that EEG can predict cognitive impairment burden at the acute stage of CH. The analysis method of EEG beta power abnormality holds a promising to assess the cognitive impairment post CH. The cognitive impairment post hemorrhage was positively correlated to hemorrhage type and negatively correlated with hemorrhage size and amount. 1. Mathew T, Sarma GR, Kamath V, Roy AK. Subdural hematoma, subarachnoid hemorrhage and intracerebral parenchymal hemorrhage secondary to cerebral sinovenous thrombosis: A rare combination. Neurol India 2007;55:438-9. 2. Garcia PY, Roussel M, Bugnicourt JM, Lamy C, Canaple S, Peltier J, et al. Cognitive impairment and dementia after intracerebral hemorrhage: A cross-sectional study of a hospital-based series. J Stroke Cerebrovasc Dis 2013;22:80-6. 3. Turaga SP, Mridula R, Borgohain R. Cerebral glucose metabolism, clinical, neuropsychological, and radiological profile in patients with corticobasal syndrome. Neurol India 2013;61:7-11. 4. Ganguli M, Dodge HH, Shen C, DeKosky ST. Mild cognitive impairment, amnestic type: An epidemiologic study. Neurology 2004;63:115-21. 5. Balsamo S, Willardson JM, Frederico Sde S, Prestes J, Balsamo DC, Dahan da CN, et al. Effectiveness of exercise on cognitive impairment and Alzheimer's disease. Int J Gen Med 2013;6:387-91. 6. Tatemichi TK, Paik M, Bagiella E, Desmond DW, Stern Y, Sano M, et al. Risk of dementia after stroke in a hospitalized cohort: Results of a longitudinal study. Neurology 1994;44:1885-91. 7. Godefroy O, Bogousslavsky J. The Behavioral and Cognitive Neurology of Stroke. Cambridge: Cambridge University Press; 2007. 8. Waldemar G, Dubois B, Emre M, Georges J, McKeith IG, Rossor M, et al. Recommendations for the diagnosis and management of Alzheimer's disease and other disorders associated with dementia: EFNS guideline. Eur J Neurol 2007;14:e1-26. 9. Smits LL, Liedorp M, Koene T, Roos-Reuling IE, Lemstra AW, Scheltens P, et al. EEG abnormalities are associated with different cognitive profiles in Alzheimer's disease. Dement Geriatr Cogn Disord 2011;31:1-6. 10. van Gool WA, Stam CJ, Steenhoek A, Hagemeijer A. The practice guideline 'Diagnosis and pharmaceutical treatment of dementia'. Ned Tijdschr Geneeskd 2006;150:839-43. 11. Moretti DV, Paternicò D, Binetti G, Zanetti O, Frisoni GB. EEG markers are associated to gray matter changes in thalamus and basal ganglia in subjects with mild cognitive impairment. Neuroimage 2012;60:489-96. 12. Moretti DV, Babiloni F, Carducci F, Cincotti F, Remondini E, Rossini PM, et al. Computerized processing of EEG-EOG-EMG artifacts for multi-centric studies in EEG oscillations and event-related potentials. Int J Psychophysiol 2003;47:199-216. 13. Baker M, Akrofi K, Schiffer R, Boyle MW. EEG patterns in mild cognitive impairment (MCI) Patients. Open Neuroimag J 2008;2:52-5. 14. Yoo SD, Kim DH, Kim GK, Bark J. Characteristics of computerized neuropsychologic test according to the location of aneurysmal subarachnoid hemorrhage. Ann Rehabil Med 2011;35:680-6. 15. Zhao J, Tang H, Sun J, Wang B, Chen S, Fu Y. Analysis of cognitive dysfunction with silent cerebral infarction: A prospective study in Chinese patients. Metab Brain Dis 2012;27:17-22. 16. Zadikoff C, Fox SH, Tang-Wai DF, Thomsen T, de Bie RM, Wadia P, et al. A comparison of the mini mental state exam to the Montreal cognitive assessment in identifying cognitive deficits in Parkinson's disease. Mov Disord 2008;23:297-9. 17. Jiang ZY. Study on EEG power and coherence in patients with mild cognitive impairment during working memory task. J Zhejiang Univ Sci B 2005;6:1213-9. 18. Kelly KM, Shiau DS, Jukkola PI, Miller ER, Mercadante AL, Quigley MM, et al. Effects of age and cortical infarction on EEG dynamic changes associated with spike wave discharges in F344 rats. Exp Neurol 2011;232:15-21. 19. Kamei S. Electroencephalogram and event-related potential analyses in Parkinson disease. Brain Nerve 2012;64:433-43. 20. Giannakopoulos P, Missonnier P, Gold G, et al. Electrophysiological markers of rapid cognitive decline in mild cognitive impairment. Dement Clin Pract 2009;24:39-46. 21. Poels MM, Ikram MA, van der Lugt A, Hofman A, Niessen WJ, Krestin GP, et al. Cerebral microbleeds are associated with worse cognitive function: The Rotterdam Scan Study. Neurology 2012;78:326-33.